Well I can truly say that I didn’t see this one coming. Cash Money Records has added Paris Hilton to their label. Paris Hilton revealed the news yesterday to Showbiz 411. Paris will release her sophomore album under the Cash Money label. The album will be full of house music, unlike her first album that was in the pop genre, and will probably feature an appearance from Lil’ Wayne, since he dabbles a little in that music. Paris Hilton just happens to be featured in Birdman’s most recent video “Tapout,” which features Lil’ Wayne, Future, Mack Maine and Nicki Minaj. I’ll have to hold my tongue on this one. Paris’ first album was terrible, and I’m not sure if even Cash Money can make her sound good. 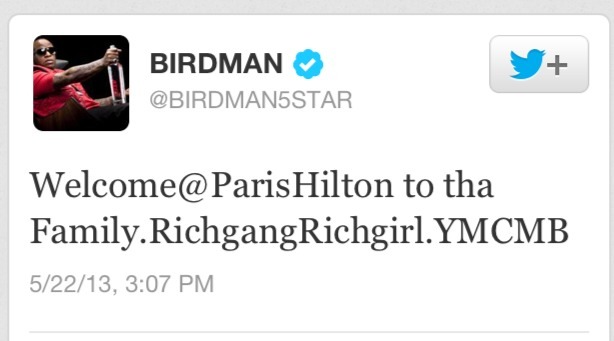 I understand Birdman and Lil’ Wayne wanting to branch out and have a diverse selection of artists, but Paris Hilton. I guess we’ll just have to wait and see and this turns out!